Thursday Night Football has moved from CBS to NFL Network, but The Talk is still sharing tailgate recipes from chefs like Jet Tila. Check out his Thai Chili Garlic Hot Wings, Naga Dogs, and a refreshing watermelon drink! Tila is owner of the new LA restaurant Stir Market, and he is no stranger to The Talk kitchen. Check out some of his other ideas, like Seared Scallops or Chicken and Shrimp Pad Thai. Bread the wings while they’re wet, after rinsing, “to get that perfect, crispy coating every time,” Tila said. You then dredge them in two different flours. 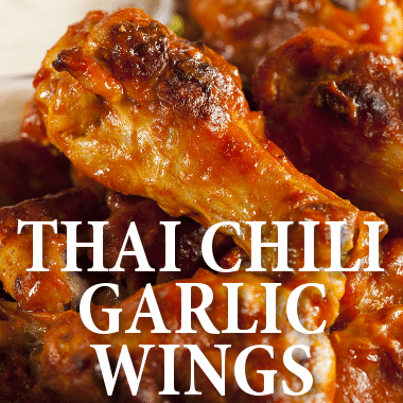 Of course, the real delight when it comes to wings is spicing them up with a sauce to die for. Tila promised “sweetness, Umami, and Sriracha” in the flavor profile for this dish. Take your wings right from the fryer directly to the sauce so that it will cling to the meat while it’s still hot. As anyone who has ever eaten them knows, there is not a dainty way to eat wings, and Tila suggested going for broke. For a laid-back motif, try serving your guests these wings with newspaper on a small platter to discard bones, and encourage everyone to make a big mess while they eat. Combine sauce ingredients and reserve. Rinse chicken wings but do not dry them. Sprinkle wings with flour in an even layer. Heat oil in a deep fryer to 350 F.
Dredge chicken wings in cornstarch. Fry wings in batches for about nine minutes, turning once or twice, until fully cooked. Once cooked, salt and pepper the wings. Toss in sauce before serving.